I speak with dog owners and advise them about their pets nearly every day. Sometimes I think to myself, “Maybe this advice could help other people, too.” Details of the people and dogs involved have been changed to protect client privacy. The situations are real. Stella, Joe’s five-month old boxer, hits him up for roughhouse games after she eats. Full of food and full of herself, Stella seeks to blow off steam with her favorite chew-toy. Unfortunately for Joe, he is Stella’s favorite chew-toy. She jumps on him, bites him, and tugs on his pant leg. Joe is usually distracted trying to prepare his own meal, so after the assault, Stella sneaks off to pee and/or poop on the carpet. Stella needs some manners before these after-meal attacks become ingrained behavior, a dangerous habit as she and her teeth get bigger. Joe and I agreed to meet later that week to begin teaching Stella to interact politely with him, his visitors, and other dogs. In the meantime, Joe must take steps to immediately halt the post-repast shenanigans. Stella starts loving her crate – it’s where food happens! After a few meals, most dogs develop a cheerful and enthusiastic opinion of their crates. Housetraining starts to make sense. Joe has the luxury of taking Stella directly from her crate to her toilet area outside. Dogs, especially youngsters, usually have to go potty after eating. The crate ensures that Stella waits until she’s outside to take care of business. The Attack Dad After Eating routine is interrupted. Stella is compelled to adopt the new, socially acceptable habit of relaxing quietly after meals. Instilling a passion for “politically correct” chew toys can help protect your yard, too! 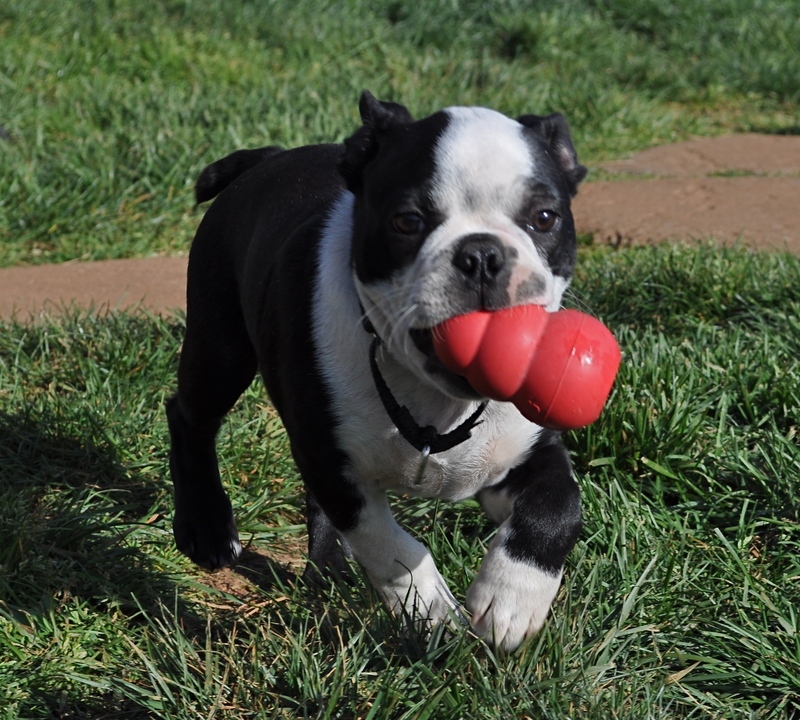 More, if Joe wants to super-size his crate-training benefits, he can stuff part of Stella’s meal into a Kong® toy. Interactive toys help dogs become focused on what they CAN chew while providing a much-needed outlet for abundant puppy energy. Chewing is a hypnotic activity for dogs and once the Kong® toy is cleaned out, Stella will likely nap while she waits for Joe to take her outside. Arrivals & Departures scheduled by Appointment between 9:00 a.m. – NOON or between 4:00 – 6:00 p.m.